This Wesleyan Methodist Church accepts that there is a clear difference between the Clergy; (People called, who are separated unto full time ministry) and the Laity; (the ordinary local church membership). This Wesleyan Methodist Church agrees, that the full time ministry conducted by the Clergy is divided into a five fold Ministry; Apostolic, Prophetic, Evangelistic, Pastoral, Tutorial. The Delegated Authority or Hierarchy of that Five Fold Ministry: The Wesleyan Methodist Church acknowledges the Apostolic and Prophetic offices make up the Episcopal oversight of the church and these individuals are called (Bishops), Evangelists, Pastor - Teachers or Pastors and Teachers make up the general Clergy of the church and these individuals are called (Ministers). The Oversight of the Church is therefore administrated by the Apostolic and Prophetic overseeing Ministers called Bishops. Theological Seminaries connected to the Wesleyan Methodist Church have Bishops in oversight and Deans for administration. The ordinary service in each local church is administrated by Evangelistic, Pastoral and Tutorial Ministers, aided by Deacons as Lay Ministers. All of the above, with the exception of the Deacons and general membership mentioned below, hold the title "Reverend" and are referred to as such. In the case of those who hold Doctorates or those who are Chaplains to the Military or in Service to their country, their respective titles will precede their name after the title of "Reverend" e.g., "Revd. Dr. John R. Kirkwood PhD, or Revd. Maj. William B. Johnson RAF, with their subsequent degrees or regiment following their name. The Congregation of the Faithful presented at the The Annual General Synod and The World Conference of the Wesleyan Methodist Church. the communion of "His Body Members" in local Churches for Worship, Fellowship and Witness. Scriptural Early Church Government. It is clear from both 1st Corinthians 12:28 and Ephesians 4:11 that the order of rank is described clearly by the order in which the ministerial offices are mentioned. Particularly in 1st Corinthians 12:28 where the Apostle Paul gives clear definition as to their order of hierarchy. Historic directive and influence on The Wesleyan Methodist Church. Early church history from the time of the Apostles of Christ bears out that the church clearly held to Episcopal government. It is compulsory for Clergy and Membership to accept all of the Principles, Beliefs, Doctrine, Separation, Faith and Practice of the World Conference of the Wesleyan Methodist Church. These are the major points of policy that we expect our Clergy and Membership to believe, accept and promote. Theological Training recognized by The Wesleyan Methodist Church: The only way that an individual trains for our licensed or ordained ministry is because that they have been proposed and promoted by their local Church and its Pastor. Training is not open to the general public or church membership at large. A person who is called to become a licensed or ordained Minister of the Wesleyan Methodist Church, first needs to make that known to the Pastor and leadership of their local WMC Church. They will also have needed to be a full member of that local church for some specified time. If the leadership of that local church decides to formally recognise that the individual is to make application to study for the ministry of the WMC Church, then a letter from the applicant's Pastor together with a personal initial letter of request must be sent to head office. The applicant must be admitted to a Seminary that is recognised by the overall Synod and conference of the Church. It is the preference of the Wesleyan Methodist Church, to have its Ministers theologically trained and recognized by the Wesleyan Methodist Church. It is also a secondary preference of the Wesleyan Methodist Church, to have Ministers who have been theologically trained in the United States of America, in a Seminary recognized by The Wesleyan Methodist Church. Other than the Jacobus Arminius Centre for Theological Studies and the Independent Methodist Theological Seminary, the Wesleyan Methodist Church generally does not formally recognize foreign Universities or Theological Institutions, except when they have a connection with an American Bible College or Seminary or are a Branch Affiliated American degree granting Institution. We accept that there are Seminaries across the world that are fundamental to the same principles of doctrine, faith and practice. However, we have found that in certain countries there is marked anti Americanism and in others there is blatant capitulation by Christian Institutions to secular ascendancy within their societies. The United States may not have political foreign policy that is acceptable to all foreign nations, however, there are more "Born Again" Christians, Churches, Missions and Godly Seminaries in America than in any other nation on earth. Therefore, as Pentecostalism and its origin in Methodism has its major publicly witnessed origin in the United States, we see anti - Americanism as repugnant and racist. The Wesleyan Methodist Church reserves the right to agree its own policy in regards to ministerial training and it is our prerogative to discern what theological training we agree is sufficient for Ministry. We also encourage all of our Churches, no matter where they may be located or in which country they are situated, to establish a Bible Institute. These should be started on a "part-time" basis initially. This encourages the church membership to hear from the Lord in relation to their own personal walk with God and the possibility that He may call them into full time ministry. These Church Bible Institutes are not considered as colleges or seminaries. However the respective Church body around them should pray, that the students would proceed to a Theological College or Seminary from their Church's little Bible Institute. In this sense these "part-time" Church Bible Institutes are a stepping stone for people called to ministry. On some occasions, a Church "part-time" Bible Institute may get itself to the place where it becomes large, begging to be "full-time", with a number of teachers and a comprehensive library. At this point that Bible Institute may want to graduate from being what it is into being a branch affiliated outreach college of a fully recognized Theological Seminary. Or, it may want to take the larger step of being a fully chartered and accredited College and Theological Seminary accepted by the Independent Methodist Church. To achieve this transition, the Wesleyan Methodist Church has procedures in place for such a wonderful development. The Wesleyan Methodist Church statement of faith can be found on the "Doctrine" webpage itemized on the navigation bar above. In Apostolic times the only extra-congregational authority to the local church was that which resided in the apostles. That same apostolic authority is now continued in the churches in the authority of the Scriptures. Therefore we do not accept natural apostolic succession but rather an Episcopal structure in each congregation, with hierarchy above giving oversight, facilitation and encouragement to each church rather than "lording it" over them. This does not mean that that hierarchy shouldn't be honored and respected, but rather when the five fold ministry has a "laid down life" upon Christ, then churches and body membership is built up upon good leadership. We recognize that in order to recognize this sole authority of the scriptures in matters of church organization, a local church must be spiritually responsive. This places upon local church leadership a great responsibility to develop such responsiveness in the congregation. We realize that where a church is not sensitive to the authority of the scriptures, its affairs might become dominated by carnal local authority. Nevertheless, this calculated risk is part of the price we pay for spiritual freedom. It is further recognized that the autonomous principle, if unaccompanied by this spiritual life and responsiveness, may sometimes result in disunity and ultimately, extinction. However, this is not due to an inherent weakness in the scriptural principle itself. For when life departs from any living organism, disintegration and decay set in, and no amount of organizational effort can give true spiritual life to a dead church. Although the New Testament pattern does not call for organic union of local churches or centralized authority over local churches, it does reveal a wonderful spiritual fellowship and voluntary cooperation among such assemblies. The New Testament scriptures supply clear examples of such interaction. The love and fellowship existing among these, autonomous churches is illustrated by the cooperative effort of the Gentile churches in sending relief to the impoverished and suffering churches in Judea. See 2 Cor. 8-9; Romans 15:25-27. Local churches of apostolic days never were private enterprises, functioning for the enrichment of self appointed local leaders or overlords. Their duly appointed or selected officers, elders and deacons, were servants and overseers, whose responsibility it was to care for the spiritual and temporal needs of the congregation. See Phil. 1:1; 1 Tim 3:1-13, 1 Thes. 5:17, 1 Pet. 5:1-4; Acts 10:17-35. To the fulfilling and preserving of these simple scriptural principles of local church life and work and inter-church spiritual fellowship, we humbly direct our cooperative efforts. 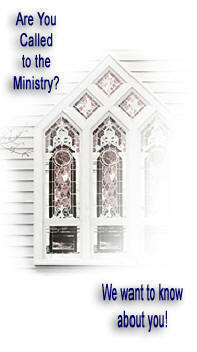 We do not advocate nor practice control over our ministers, ministries or churches. We recognize autonomy of the local church, however, it is not an island and is expected to serve in unity and fellowship. We expect all affiliated churches and ministers to practice sound doctrine. We adhere strongly to professional ministerial ethics as relating to ministers and churches. A distinct call to ministry is a must for credential. A lay person who is qualified and certified to teach, visit the sick, minister in hospitals and jails, as well as assist in many of the functions of the church. A person who is qualified for evangelism, teaching, administrating, and in some cases, pastoral (excluding the performance of marriages, baptisms and burials and the administration of the sacraments). To be a Licensed Minister of The Wesleyan Methodist Church, a candidate who seeks to enter our licensed ministry must have first been sponsored by one of The Wesleyan Methodist Church's recognised Sponsors, who makes recommendation to the Wesleyan Methodist Church by signing as the sponsoring Pastor of the candidate seeking acceptance both by the Board and Ordination Council and then Endorsed by our Board and Ordination Council of The Wesleyan Methodist Church. Ordained Minister: (This is the highest credential offered). This would be a person who has a recognisable vocational ‘calling of God’ to the Christian Ministry evident upon their life. This person would also need to be a properly educated applicant, having gained a religious vocational educational degree at Bachelor of Divinity or Diploma of Theology level or above, with proven practical experience in a lay capacity within the courts of the church. An applicant for ordination who is desirous of becoming accepted as a candidate for ordination, but who is a mature applicant or has not gained any recognised religious vocational education in the form of a diploma or degree, can, if agreed at interview stage, follow a course of study to achieve such, by way of the course of study then determined by the ordination council. To be an Ordained Minister of The Wesleyan Methodist Church, a applicant who seeks to enter our ordained ministry must have first been sponsored by one of The Independent Methodist Church's recognised sponsors, who makes recommendation by signing as the sponsoring Pastor of the candidate seeking acceptance both by the Board and Ordination Council and then Endorsed by our Board and Ordination Council of Wesleyan Methodist Church for both licensing and ordination. A person seeking ordination must also have undergone our licensing procedures although generally candidates are licensed and ordained with all legal paperwork then being endorsed at the same time. Presentation of application together with all original transcripts of the applicant's educational suitability to the Wesleyan Methodist Church. If the applicant is successful and acceptable at interview stage, the applicant, now 'candidate for ordination', must then present themselves before the Ordination Council. If the candidate is successful in being acceptable by the Ordination Council, the Church Board of the Wesleyan Methodist Church and all paperwork has been ratified by the the Board and Ordination Council being in agreement that they should issue certification paperwork, then a public Ordination Service will be arranged and the person shall be duly ordained as a minister, acceptable to the courts of the Church and according to the law of the land. Divorce is not an answer. Truly repentant people who have been divorced, hate divorce and would have never have wanted it to happen to them. The Wesleyan Methodist Church has a very strong stand against divorce, however the Church recognizes that it happens and that God has forgiveness for all and every person who comes to Him with whatever sin or failure. The Wesleyan Methodist Church also recognizes that Ministers can undergo divorce and that this may or may not be their personal fault. However, repentance, counsel and restoration are available for all. A person who is divorced or who has been remarried can become a minister or continue within the Wesleyan Methodist Church providing a number of procedures are adhered to by the individual. These procedures are specifically set for each situation by the Conference of Bishops. Their personal life, including the reasons as to why they have undergone divorce or been remarried, will merit being brought before the conference of Bishops and Deans of the Wesleyan Methodist Church, before ministerial credentials would continue, be recognized, ordination take place and or appointment to ministry proceeds (licensing). Below are a few of the acceptable styles of clerical attire. The Clerical Collar is of course absolutely required to be worn by all of our clergy while conducting ministry in an official capacity or present at any religious event. It is also compulsory for all of its clergy to wear the clerical collar and any other clerical attire deemed necessary for our Christian religious public expression when our ordained clergy are attending any public event or public ceremony and or any civic or civil ceremonies as a participant witness observer or guest. > For a better understanding of why we require our clergy to wear the clerical collar and the true background and history of that ministerial collar click here.